This week, from Monday, November 26 to Friday, November 30, features The Los Angeles County Tree Lighting, L.A. Zoo Lights, Canon PORTALS, a Tree Lighting Ceremony at Union Station, HYPERSPECTIVE, free immersive film festival, The Silent Skate Party, and MUCH more. eep in mind that while we retain complete editorial control of our content, for some of the ticketing options provided we utilize affiliate links and receive a commission if you purchase through our links. 3. 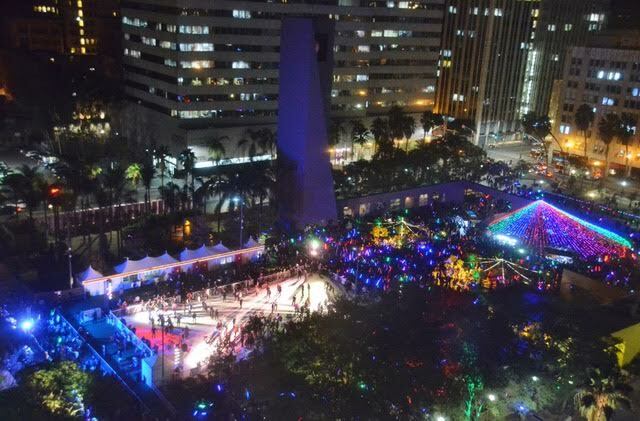 The Bai Holiday Ice Rink returns to Pershing Square from Nov. 15, 2018 to Jan. 21, 2019 daily featuring a 7200 square foot outdoor ice-skating experience. A wide variety of events will take place throughout the duration of the rink. 5. Beautycon is offering a pop up expereince titled Beautycon POP from Nov. 16 through Dec. 16 daily featuring immersive galleries, makeup brands, vendors, a salon and other beauty related activities. 10. It’s that time of the year to celebrate the holiday season, which is the main purpose of Fa La Land, a pop up museum at Row DTLA. Guests will enjoy a wide variety of installations like a Jingle Bell Toy Factory and a fluorescent “Fa La Forest.” Fa La Land runs Nov. 18 through Jan. 6, 2019. Happening Tuesdays through Sundays. 11. See a fake American Town Hall set in a “new” town but really it’s at The Virgil. The hilarious comedy show donates all ticket sales to the ACLU! 13. The Foodie Space (Nov. 21- Dec. 30) is the latest interactive pop-up museum designed for serial foodie photo-taker’s. Located in Pasadena the museum claims to poke fun at society’s obsession with social media and #foodporn. Food-themed exhibits include a giant bowl of phở, glitter fries that you can marry and more. Happening Tuesdays through Sundays. 15. Celebrate the holiday season during a Queen Mary Christmas (daily Nov. 23 – Jan. 6) The special occasion will see Christmas spirit lining the famous Long Beach vessel including an 80-foot Christmas tree, a variety of holiday activities, an outdoor staking rink, musical performances, a 4D showing of The Polar Express, and dinner shows on select dates. 16. The Holiday Light Festival Train Ride at Griffith Park is a festive one mile ride on the tracks with tens of thousands of lights to get you in the Holiday spirit. Running daily Nov 23 through Dec. 23 and then again from December 26 to December 30. 17. The annual LA Kings Holiday Ice happening at L.A. LIVE’s Microsoft Square is a daily outdoors holiday skating rink. Open November 10, 2018 through January 6, 2019. 19. It’s trivia night at Grand Central Market this Wednesday on the Broadway side of the food hall. 23. Head down to The Fairplex at Pomona for the Chinese Lantern Festival where the theme is “The Wild,” featuring animals represented in lanterns from five different areas of the world, Antartica, Asia, Oceania, Africa and America. Some of the larger pieces stand all the way up to 23 feet tall. The festival run every Thursday through Sunday from Nov. 15 – Jan. 16. 24. Party With is Los Angeles’ new Instagram-ready experience. Opening it’s doors on Friday Nov. 16 in Westfield Santa Anita Mall, folks can expect 15 premium photogenic installations like an infinity rainbow and a room filled with sparkling disco balls. Party With runs through January 27 and is open Thursdays through Sundays. 25. Notorious RBG explores the life and career of Ruth Bader Ginsburg through a collection of contemporary art, archives, interactives, archival photographs and more. Each gallery section will allude to a song by the Notorious B.I.G. as the name of the exhibit suggests, and will playfully bring out the similarities between the two. Happening at the Skirball Cultural Center. The exhibit runs until March 10. The museum is free every Thursday. 27. LACMA’s latest exhibit, Outliers and American Vanguard Art, highlight a period in American art history when avant-garde artists and outliers (that is, artists without formal training) intersected. 29. The Silent Skate Party is back at the Pershing Square Holiday Ice Rink. Headphones are provided to all skaters, who then have the ability to choose one of three stations to skate to. 31. Pomona Harvest Festival happening at the Fairplex Expo (Nov. 30 – Dec. 2) will feature vendors showcasing handmade jewelry, blown glass, metalwork, photography, and much more. 32. Since 1969 Bob Baker’s Marionette Theater’s adaptation of the Nutcracker has been warming hearts and delighting kids and adults during the holidays. The show includes over 100 handmade puppets at the Pasadena Playhouse. Running now until Dec. 30. 33. LA Auto Show returns with thousand cars on display. From Nov. 30 to Dec. 9 experience various car exhibits, model debuts and more at the LA Convention Center. 34. The Annual Tree Lighting Ceremony in Downtown Alhambra will bring in the holiday season with a concert with the Alhambra Chamber of Commerce and a pop-up holiday shop. 35. Silent Night, Silent Disco at FIGat7th will feature three DJs curated by KCRW’s Anthony Valadez. The event is open to all ages and is free to attend with donations of food and or new toys required for entrance. 36. Uptown Whittier Holiday Sonata celebrates “Holidays Around the World” with a Santa’s Village plus a horse drawn carriage this Friday and Saturday. Photo Credit: Christina Champlin // We Like L.A.
Japanese kaiseki newcomer INN ANN at JAPAN HOUSE Los Angeles opens to the public on Tuesday, November 27, 2018. The concept will feature a lineup of Japanese chefs, including some Michelin-decorated talent. A night at INN ANN is like a crash course in kaiseki-style dining straight out of Kyoto. You’ll experience a series of small dishes prepared with Japanese techniques and seasonal California ingredients. For the opening, the tasting menu is overseen by Chef Taro Araki, Executive Chef for the Consul General of Japan in Los Angeles. This means you’ll dine like foreign dignitaries, prime ministers and presidents from around the world. It starts with a zensai. Nine bite-sized offerings come neatly arranged in a decorative bowl. 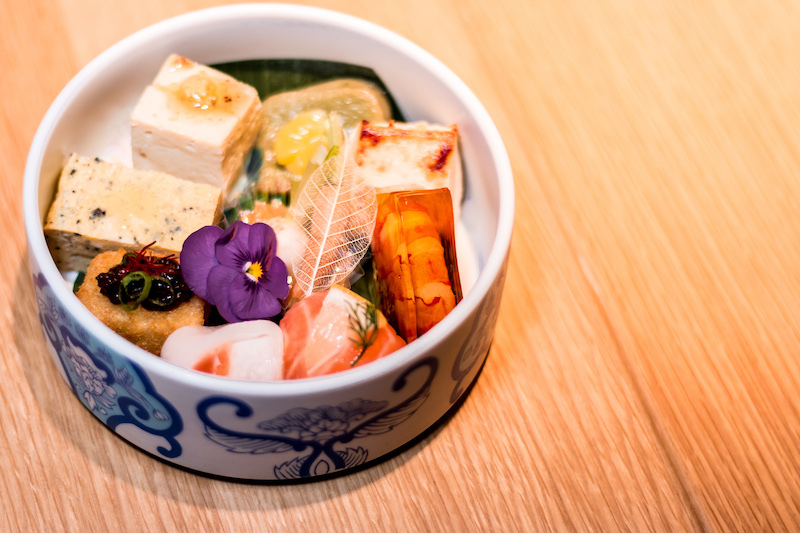 Open the lid to find delights that include a Japanese omelet with truffle, shrimp in dashi jelly, and miso marinated grilled cheese. A chef’s choice sashimi course comes next. Follow that up with choice between shabu shabu of Kagoshima wagyu and vegetables, or grilled Kagoshima wagyu beef in Saikyo miso. If you are dining with a partner, opt for one of each to get a taste of that same wagyu cooked two ways, one with fire and the other in water. Your fourth course is a small plate of nigiri sushi and miso soup with fish. Room temperature slices of buttery toro and other fish fill your plate, and then your belly. It’s the perfect palette cleanser before transitioning to dessert, where you choose between a chestnut crème brûlée or the orange purin, a Japanese custard pudding that holds the same texture as flan. Neither is overly sweet, which you will surely appreciate after a long, satisfying meal. Omakase menu prices range from $75-100. The beverage program features Japanese wines and spirits including rare sake, shochu, and Japanese whiskey, as well as a cocktail list designed to pair with the omakase meal. INN ANN is located on the 5th floor of Hollywood & Highland at JAPAN HOUSE 6801 Hollywood Blvd., Los Angeles, CA 90028.